Firefighters and EMS worked together at the farm safety training put on by the Versailles FFA. 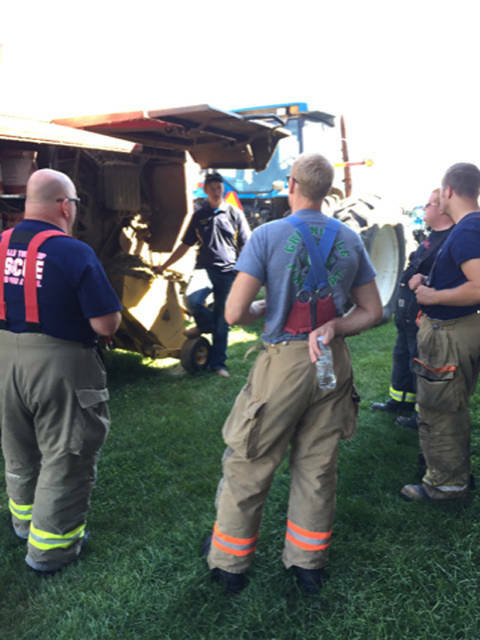 Versailles FFA President Jacob Wuebker led a hands-on demonstration of modern agricultural equipment during the farm safety training day. VERSAILLES – The Versailles FFA, North Star and Versailles fire departments hosted the biannual EMT/firefighter safety training on Sept. 29 with more than 60 attendees in attendance. The program started off at the North Star Community Center with a welcome from Versailles FFA President Jacob Wuebker. Following the welcome were guest speakers including Sam Custer, the OSU Extension agent for Darke County, who spoke about ag chemicals; Dr. Dee Jepsen, who spoke about manure storage safety and farm hazards; Shawn Brandenburg, who spoke about Darke County HAZMAT; and Justin Feltz of Weaver Brother Eggs, who spoke about modern agriculture building structures. Then, there was a free meal prepared by the Versailles FFA. The program then was taken outside to Buschur Dairy Farms for sessions that allowed hands-on experience for the firefighters and EMS personnel. 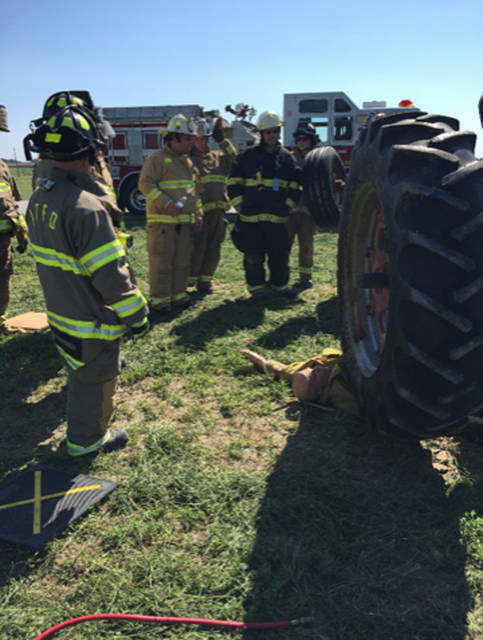 The sessions included hands-on demonstrations of modern ag equipment, electrical hazards and safety presentation, tractor rollover, entrapment scenario and PTO mock accident. Versailles FFA thanked Brian Pearson, Dusty Johns, Mike McClurg, Greg Langenkamp, Kurt Marchal, Bill Roll, Jim Rismiller, Ryan Buschur, Ken Wagner, Logan Brookhart, Dave Langenkamp and Scott Garrison for helping plan and implement this event and for instructing the stations. The FFA also thanked the Versailles Fire Department and North Star Fire Department for helping make this event so successful and allowing it to use their equipment. Another thank you went to the sponsors of this event including financial sponsors North Star Hardware and Implement, Phelan Insurance and Weaver Brother Eggs. The following supplied equipment and helping plan/teach the event: Hill T Farms, Buschur Dairy Farms, Wuebker Farms, North Star Hardware and Equipment, Sam Custer, Justin Feltz, Dr. Dee Jespen, Shawn Brandenburg and Rob Widener, who awarded the CEU credits. Fire and rescue departments in attendance included Lockington Volunteer Fire Department, New Bremen, Rossburg/Ansonia, Liberty Township, Silvercreek, Greenville, Versailles, Osgood, North Star and Burkettsville. Versailles FFA members who helped and attended included Courtney Batten, Cayla Batten, Tori Wuebker, Darian Feltz, Grace McEldowney, Cole Luthman, Marcus Berger, Jacob Wuebker, Caden Buschur, Laura Wuebker, Aaron Buschur, Gabe Marshall, Abby Petitjean, Breanna Nieport, Payton Niekamp, Emma Peters and Dawson Petitjean Cress.